Around 20 years ago I invited a Feng Shui expert to come to my home. He told me I needed to move my office into my bedroom and my bedroom into my living room. He also had me place specific crystals in key areas of my home. He came highly recommended - he was Madonna's expert so that's got to be good right! Interestingly though his techniques didn't work for me. You see my energy was too strong for the few crystals he used in his placements. I could completely resist their power, I knew their language! And it's because I know their language that I have successfully combined crystals with specific intentions in my jewelry and here I'm doing the same thing in a Crystal Grid Painting. I came up with this idea a few years ago. 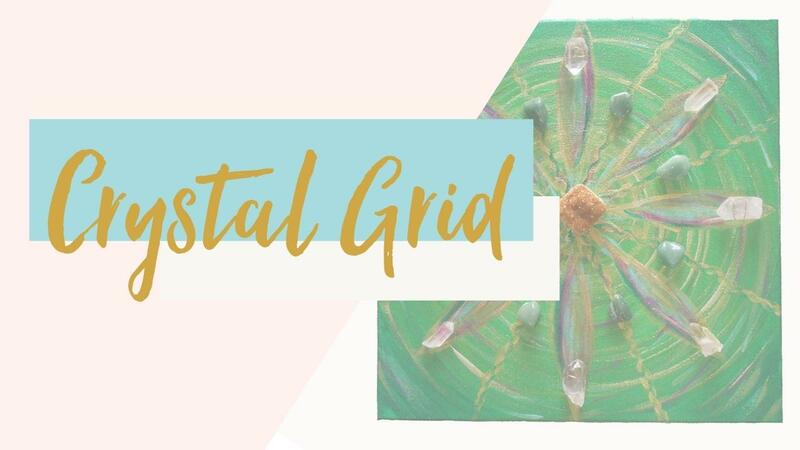 A crystal grid is the placement or alignment of a number of crystals grouped together in a sacred pattern for the purpose of manifesting an intention. Usually around 3 different types of crystals will be purposefully placed in a formation around a central master crystal. 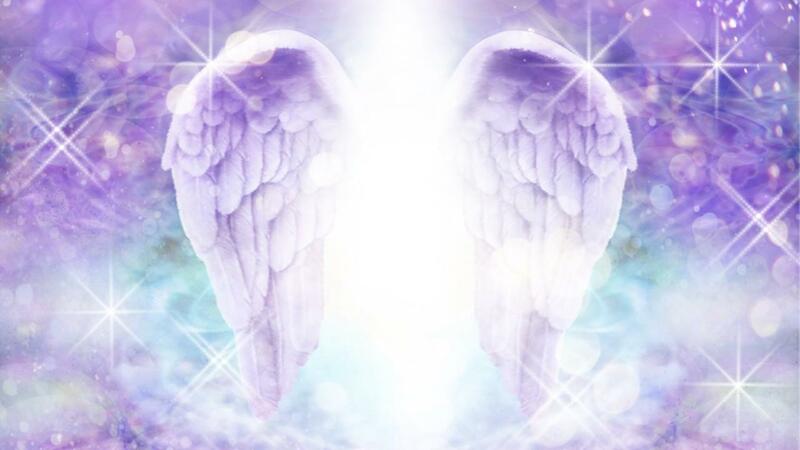 Crystals are focused inward to power up the intention of the central crystal or focused outward to release energy. 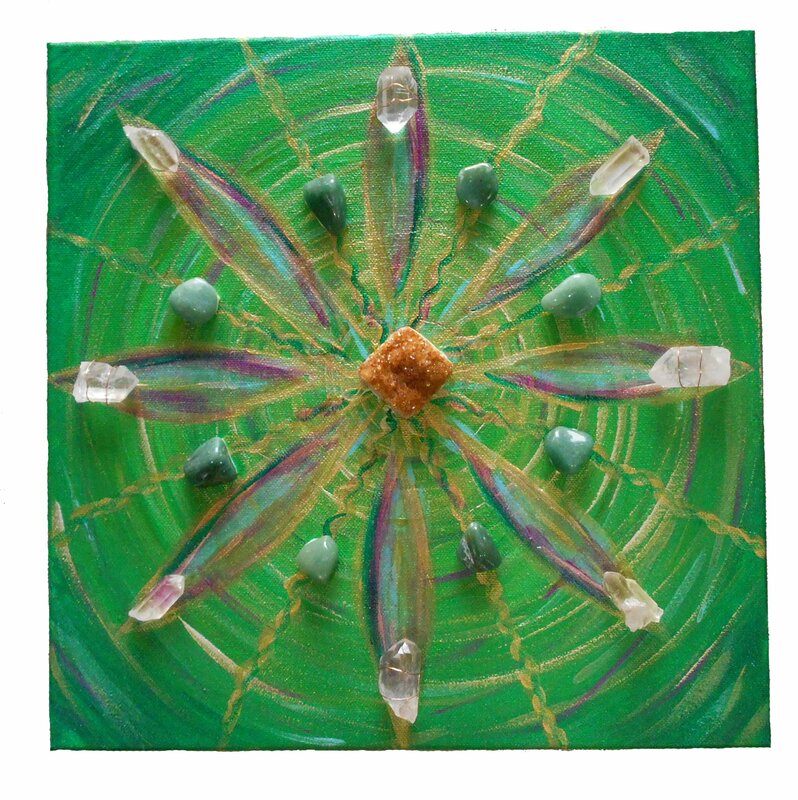 This Crystal Grid Painting is for PROSPERITY. 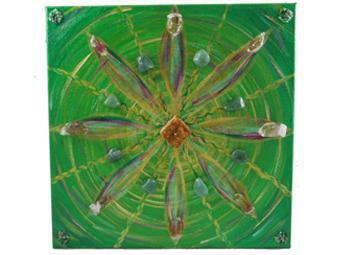 My intention was to combine the amplifying effect of crystals with the healing qualities of color. 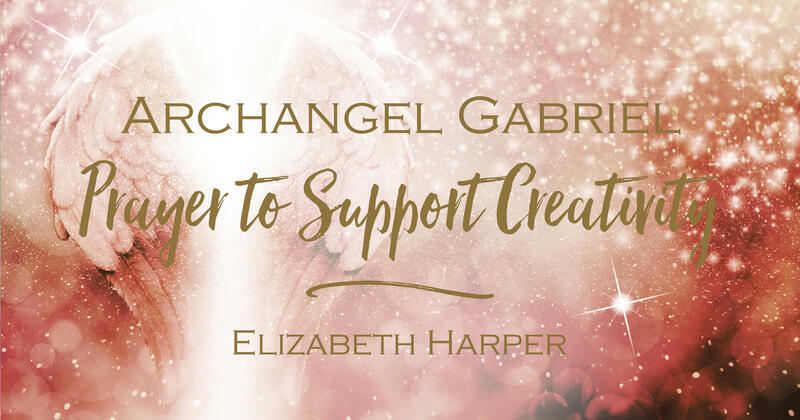 I added the intention in written form as the foundation of the grid to create a powerful three-fold tool for vibratory change. I dowsed for the right colors to use and came up with 8 colors - 8 is the number of abundance so we have a double whammy. The colors are emerald, olive, gold olive, gold, white gold, fuchsia, peridot, and sky blue. I took photos of each step as I painted the grid foundation. 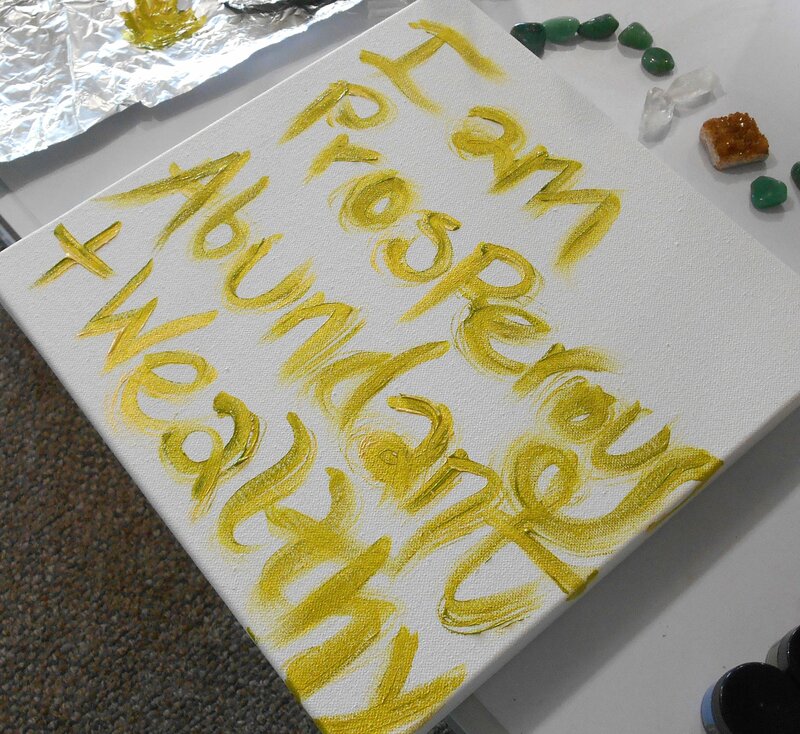 The first photo is of the affirmation I painted in gold olive and gold, "I am prosperous, abundant and wealthy." 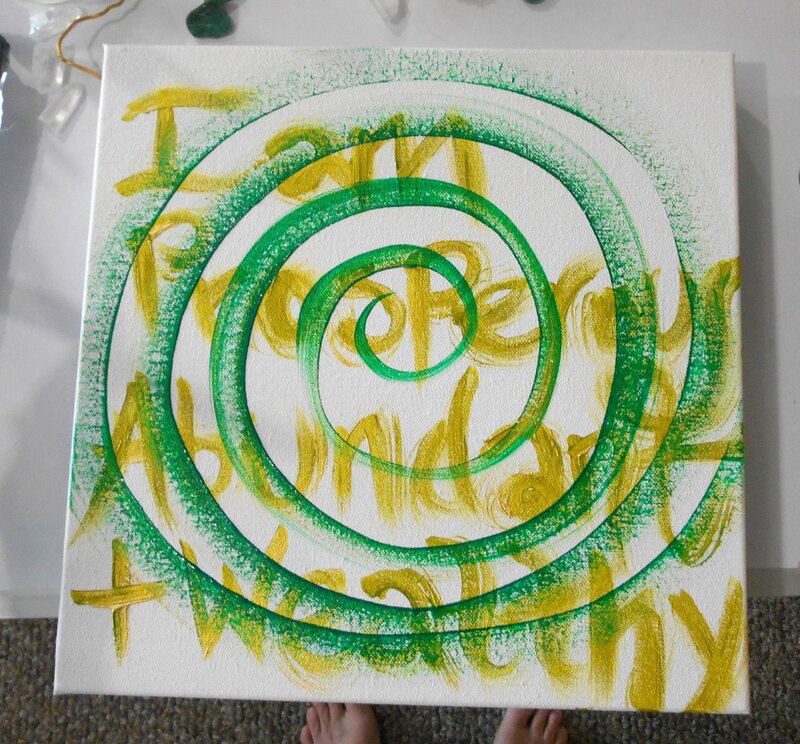 Words are energy so adding them to the painting grounds the intention into the canvas, the vibration of the affirmation will infuse the grid and empower the intention. Next I let the energy show me how it wanted to manifest on the canvas. 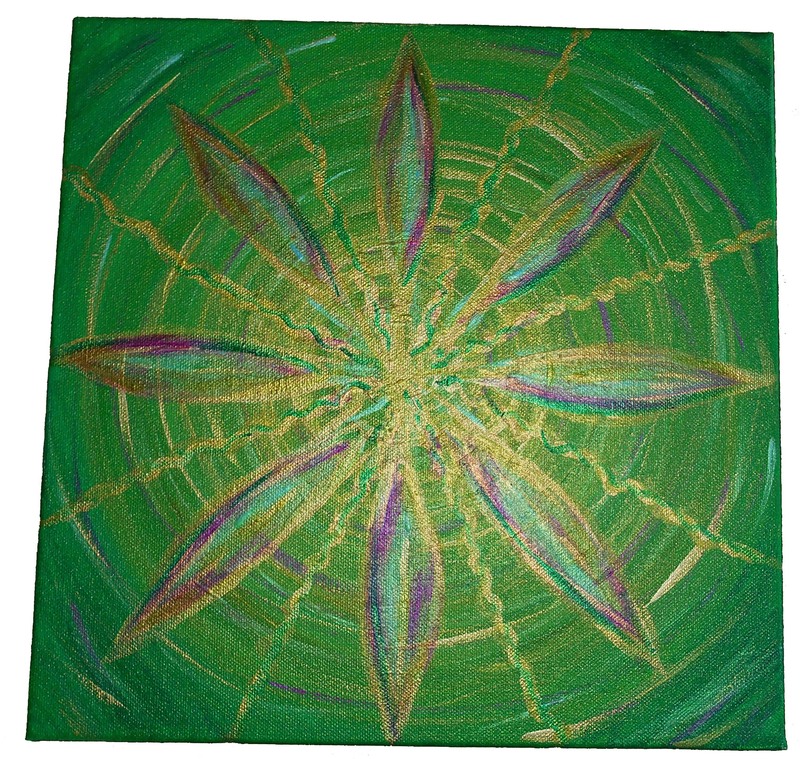 I felt the energy wanted to begin with emerald green and found myslf painting a spiral. It felt like I was painting the heart chakra. 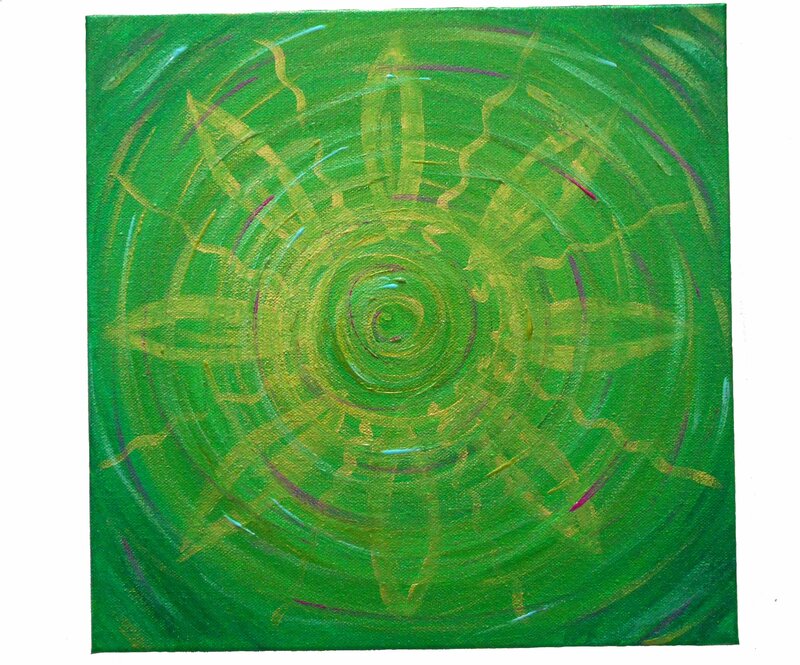 The chakra energies move in a spiral direction, spiralling one way moves energy out and another way to bring energy in. I see the chakras as if they are on a spiral staircase. If you read about the chakras in books they say the chakras spin in balancing directions. For instance, if the root chakra spins counterclockwise then the sacral center will spin oposite in a clockwise direction, but I see the energy differently. I see that they really move in the same direction they're just housed on a spiral staircase fashioned like the human DNA. As it twists it appears the energy if moving in different directions, but its not, its all going the same way. It only changes when the chakra is shifting, transforming or processing energy. Each color in my palette wanted to be part of this spiral. 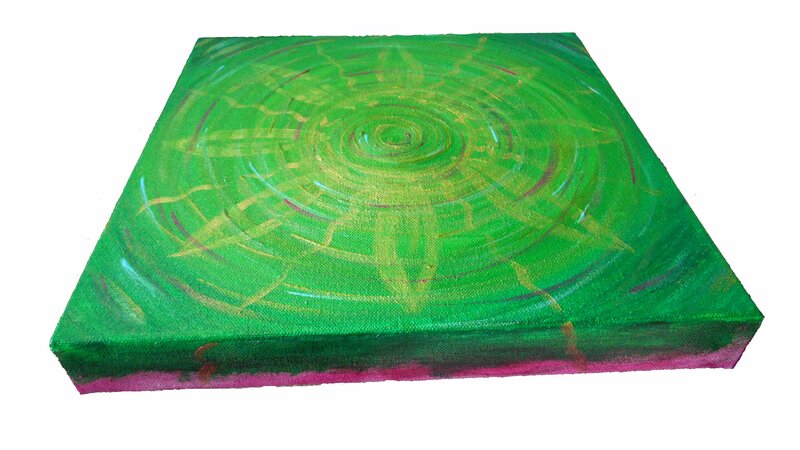 The sides of the canvas are green and fuchsia, the colors of the outer and inner heart. Once I completed the colors I was directed to create an 8-petalled flower. Often crystal grids will be formed on a 6-petalled flower of life, a piece of sacred geometry linking with love. Sacred geometry is the language of the universe. Our bodies are created on a blueprint of sacred geometric lines of light. The Earth has its own grid in its ley lines and creates the most magificent images from its core, communicating with us through sacred geometric shapes in fields of cereal called "Crop Circles." 8 is the number of manifestation, it is the infinity sign, the number of the directions and of creation. The 8 petals join in the center to create infinity symbols. Between the petals are strands of golden light. I was directed to add more color to the petals. Fuchsia is a fabulous deep pink, the color of love. Everything you want to attract contains love. Within the gold and pink petals is the sky blue, peridot, and olive, colors of healing and communicating from the heart. Pink and blue bring balance to the energy. Red is a color of immediate manifestation, pink contains love, but with the added white it allows more spiritual intervention than the red "I need it NOW" energy. With the painting part complete it was time to add the crystals. Crystals are made up of patterns of energy. When they come together with other crystals they resonate and create specific vibrations or sounds. Its like a bottle that is tapped to vibrate, all other glasses will vibrate around it. That's the same with crystals excpet in their case they amplify that sound. We harmonize and reunite with the energy of this combination of crystals. 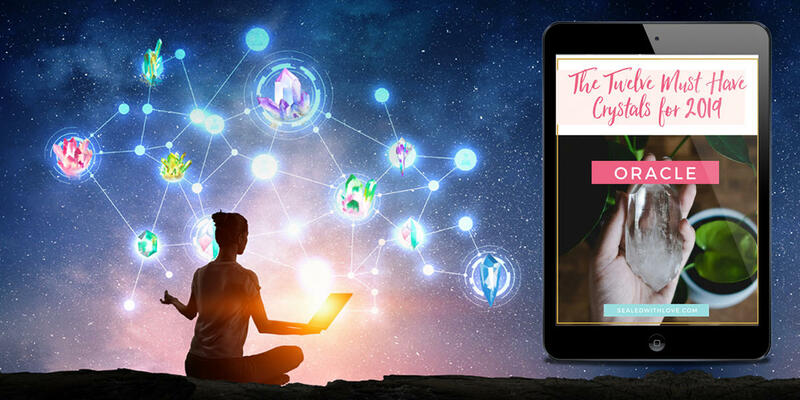 When you have a crystal grid designed with a specific intention it aligns with your energy field and creates whatever the intention is within your field. So essentially it is creating harmony within your field so you draw to you whatever the intention of the crystals is. The central crystal in a grid is the conductor of the harmonizing frequencies, like the conductor of an orchestra. It holds the vibration of the intention - the music sheet - and then atunes all the other crystals to play in harmony. In this grid the central master crystal is a citrine druzy cluster. Citrine is a stone of prosperity and success, its golden yellow color is perfect to stimulate and empower the solar plexus chakra. On the outside are clear quartz crystal points facing inward, amplifying the energy of both the green aventurine crystals for wealth and the citrine master crystal. I also added emerald crystals to the corners, you can't see them in this photo but you can in the one at the top of this article. Emerald is a heart crystal, I felt the emerald grounded the energy of the grid allowing abundance to manifest on a physical level. When the grid is complete it is charged by a charging crystal. It's a little like adding lights to your home. The charging crystal is the fuse box that brings all the other crystals together. If there is something you want to transform then a crystal grid with the added impact of color will support it's manifestation. Here are links to some of the crystals I used in this grid that will support the intention of prosperity, abundance and wealth. You don't have to create a painting, you can simply create your grid on an altar or in a devoted space where they can do their work. Have you made your own CRYSTAL GRIDS? Let me know in the comments below what kind of grid you made, which crystals you used and how successful was it for you. Angelina I have made grids for a few years now.Non of them has worked for me unfortunate.So i stop . Jennifer I am currently building a new house. I would like to drop or draw something on the foundation concrete to represent love and prosperity. Any ideas as to what I can use? I need to keep it simple so my builder doesn't freak out. This will be my first home for myself and my son. I feel like placing a symbol in the foundation is a great idea, just don't know what to put. Raven Love it!!! What a great idea! I loved reading your story about Feng Shui and how honest you were and knew it wasn't working for you- even though he helped "Madonna." I have a strong energy too, so also hard for people to work on me. Your page has great energy. Angelina I love the painting you put your grid on. Great idea. I am going to do that as well. Hope it worked and you got what you needed and wanted. Happy easter. Natalia How beautiful it is! I would love to create my own grid to manifest my heart desires and place it right in front of my dream board! What crystals would you recommend to use? Or I can use the same you mentioned in this article? Rhonda A while back I created an abundance grid.. I actually used a figure 8 and in the centre of it I placed a large citrine and then aventurine around the figure 8. I wrote down an intention that was placed under the grid. I placed things on it like a $50 note, rose quartz, an abundance talisman and many other things.. I placed a tea light candle at the 4 corners outside the grid & lit them. I announced my intentions 3 times and the used a selenite wand to infuse Christ energy into all and to activate it.. Then I let the candles burn down to nothing to seal it. You can really feel it once activated.. - Prior to this my house was burgled so my intention was really to get something back from what I lost.. On my insurance claim I was granted $1400 cash for crystals stolen.. I felt this was a direct message from my gridwork.. I have also done a love grid with rose quartz and clear quartz. I can say that energy from that was magical.. And I have done a few protection grids.. Thanks for your info.. I am inspired to paint my own back drop for my next abundance grid..
Amethyst What a beautiful piece and idea! I have to ask...are the crystals attached to the painting in some way? adebola owolabi thank you so much, your articles are very much educating and much more interesting. please can you help to check what the future have for me?